The mission of Chabad Jewish Center of Tamarac is to provide each and every Jew, regardless of background or degree of commitment, the opportunity to discover the beauty of our shared heritage in a warm, welcoming and non judgmental environment. 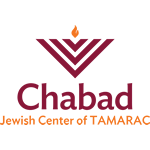 Chabad provides innovative educational and social services to the Tamarac community, in a spirit of love and brotherhood. Its purpose is to improve the quality of life through reaching out and fulfilling the needs of the community through its various programs, e.g. Hospital visitations and Holiday & Shabbat services and dinners. Chabad pledges to fulfill the mandate of the Lubavitcher Rebbe by increasing in acts of goodness and kindness for all humankind; thus preparing the world for the ultimate redemption. The following story about Rabbi Schneur Zalman the founder of Chabad will clearly illustrate the motto of Chabad. Rabbi Schneur Zalman had a son, Rabbi Dov Ber, who was known for his remarkable ability to concentrate. Usually, when he was praying or studying, he did not notice anything around him. One day, Rabbi Dov Ber was studying while his infant son slept in a nearby cradle. The baby woke up, fell out of the cradle and began to cry. Rabbi Dov Ber heard nothing. Rabbi Schneur Zalman, on an upper floor studying, heard the cry of the child, though. He interrupted his studies, came downstairs, picked up the child and soothed it. All the while, his son noticed nothing. Later on, Rabbi Schneur Zalman reprimanded his son, saying, "No matter how important a matter a person is busy with, he must always hear the cry of a child." "Hearing the cry," of a child in tears or in Jewish knowledge is a task to which we must all dedicate ourselves. It is something which Chabad-Lubavitch has always been committed to. It is a message that we aspire to instill in others—always hearing the cry of a Jew in need, no matter where or what he is.